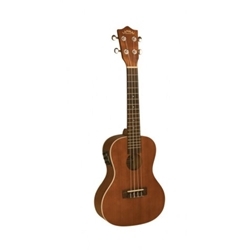 The Lanikai MA-CEC Ukulele is a perfect instrument for stage or acoustic performance. Equiped with a pickup for connecting to an amp or mixer. This great Concert Ukulele with a mahagony laminated top, back and sides and a smooth satin finish..
Comes with a Fishman Kula Pickup incorporating 3 band EQ and a built in Chromatic Tuner. For great playability the MA-CEC is equiped standard with a NuBone nut and saddle. Supurb playability and sound quality coupled with chrome open back tuners and a 5MM padded Lanikai gig bag make the bad boy a joy to play.. It is also covered by a limited lifetime warranty.